This is a followup to What data does ACARS send back to base? Can it be used to track a plane? I had asked this as a part of the earlier question, but it seems to be a large enough issue to be separate (plus no answers covered this aspect). All electronic communication systems have low level diagnostic and channel check packages (commands). By pinging, I mean to send a system specific query message, and estimate the response time at base station or first receiver. Repeat the procedure multiple times, and calculate the response time differences. (Assumption) If the response time is decreasing, then the aircraft is moving towards the receiver, if it is increasing, then the aircraft would be moving away. Couple the time difference obtained from multiple responses, with the location of the receivers (which may be satellites or ground stations). Then, approximate the plane heading, location or speed, with reference to the receiver, and then with reference to the ground. Would a process like this be possible with a high speed aircraft's ACARS? Are there any aspects specific to an aircraft that would make this impractical? When ACARS communicates via INMARSAT satellite (other options are VHF or HF to ground stations), the satellite can ping the receiver on the aircraft and determine the distance from the delay of the reply. The satellite is geostationary, meaning that it is a fixed point 35786 km above the earth. 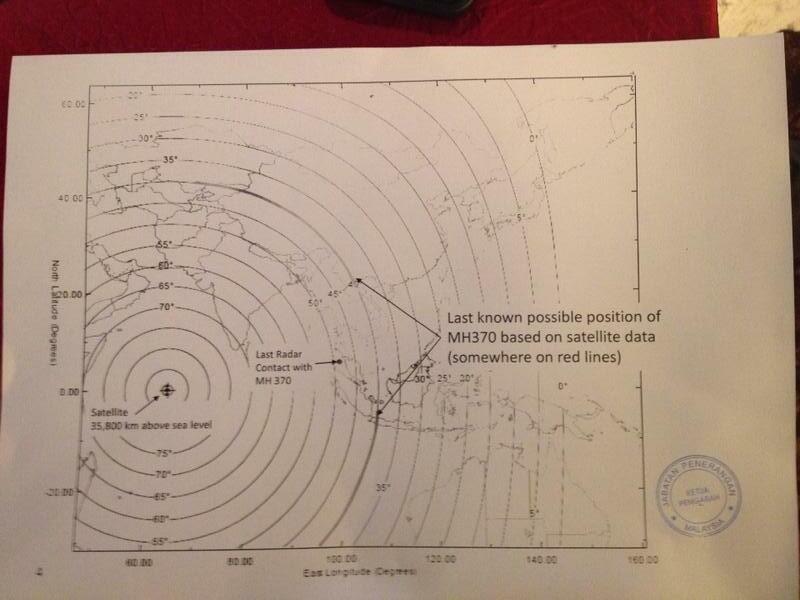 Based on the distance from the satellite you can calculate a circle where the aircraft must be on. This has been done for MH370. Since the geostationary orbit is so high, a single satellite covers a large portion of the earth. Only a single satellite covered the MH370 flight. In theory you can triangulate from any signal that is being sent from a craft, but the big problem you'll run into with this solution is that ACARS only fires off bursts every half of an hour or if the engine trips certain parameter flags. Again, a possibility but not horribly useful. These interesting posts do not answer the question of how many pings sent from the satelite were actually answered from the aircraft? The publshed data only talks about the last ping. The system is said to be automated with the satelite sending queries on a periodic basis, reportedly hourly. If each of these were in fact answered by the aircraft this would produce eight sets of data, each of which could generate an arc delimiting possible position....basically eight concentric circles centered on the satelite position, similar to the one published. One of the above posts points out that such successive data would quickly reveal the aircraft's velocity vector directly toward or away from the satelite position...given the known signal times and the distance between the concentric arcs. It would seem reasonable that one could make some assumptions about the magnitude of overall veloctiy vector...it should be a reasonable efficient cruising speed...say 400 mph...or a reasonable range. If 8 data sets were generated one or more of the earlier sets should be close to a time when the aircraft's position was known from radar. Starting from that time and position one could use the actual total speed to determine distance traveled - which would locate the two possible positions (north and south) on the next arc in temporal sequence, i.e. two possible specific locations with speed and heading at that time. One then repeats this procedure from those positions to the next arc actual in time sequence, etc. In the end this would produce two points, north and south, on the final (published) arc, representing a possible northern and possible southern location as well an approximation of the aircraft's actual tracks - either northern or southern. These plotted tracks could be useful, especially in the northern case, to identify approximately when the aircraft might have entered a specific country's radar range. Addendum: This is really a question of velocity vectors. Between any two arcs, assuming you have a position to start with, you can easily determine the aircraft velocity vector directly toward or away from the location of the satelite projected on the earth's surface. This velocity is a known quantity - it the distance between the two arcs divided by the time elapsed. It is true we do not know actual speed but we could assume a cruising speed...an efficient cruising speed for this aircraft is apparently 560 mph at 35,000 feet. So we know the magnitude of this vector (our assumption) but not the direction...northly or southerly Given the time lapse involved one can calculate the distance the aircraft would fly in this time. Set a drafting compass to that magnitude, mark a circle from the last known or calculated location and the two points where that circle intersects the next salelite arc are the putative new locations - one north and one south. In the end this should produce north and south limited portions of the final arc as more likely search areas. Granted ... there could well be an error in cruising speed assumption. One could assume an upper and lower speed and produce a range of possible locations at each arc. As one looks at a whole series of arcs it may also be possible to adjust the assumed cruise speed and to see any changes in course direction. If the aircarft had a distant goal it would seem important to choose an efficient cruise velocity to conserve fuel. Not the answer you're looking for? Browse other questions tagged avionics acars or ask your own question.